Iron Chef Morimoto is staring at me. His stern gaze graces the front of his new cookbook (DK Publishing, $40 US). And again, flipping to the introduction, one comes face-to-face with a full frontal eye lock. The chef shown in one of his restaurants, wearing a Japanese top and white apron. Funny thing about this 52-year-old chef – his Asian fusion food is much like him: beautifully-presented and a constant surprise. In a personal interview during his recent book tour, he proves to be a lovely, gregarious man. 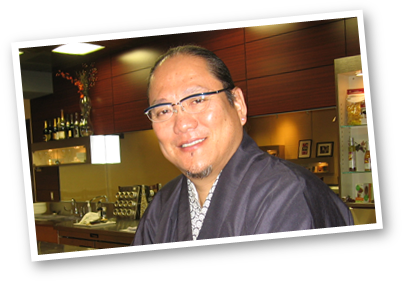 "If I marinate, it's this bunch of sauce [Morimoto makes a sweeping gesture with his arms, as if he's hugging a tree] … because I don't make recipe for four or two people, I have test, test, test" he says in his charmingly accented English. The food and photography in Morimoto's book is luscious. This cookbook isn't just for fans, it's for fanatics of fine cooking and he's put enough thought into it to attract curious beginners. Morimoto: The New Art of Japanese Cooking features simple techniques such as making sushi rice and basic recipes that include Morimoto Chicken Noodle Soup, Grilled Steak with Garlic-Soy Jus and Chocolate Tart. Morimoto was in Toronto recently to promote his first cookbook. The ebullient chef revealed that he wanted to push some boundaries with the recipes ("edge, edge, edge") but made a balance: "not too easy but not too difficult." A maverick in the world of Japanese food, Morimoto's curiousity and exploration of other cuisines is evident in the cookbook. "In my 34 years, it is always about 'twisting' … for example, the dumpling is mostly from China but to me, dumpling is ravioli! So I am serving the dumpling with tomato sauce – the twist." He smiles slyly, holding up his right index finger to punctuate the point. Indeed every section of the book contains recipes with a twist. It's neatly cut into eight sections: Sashimi and Sushi / Rice, Noodles, Breads and Soups / Fish and Shellfish / Duck, Chicken, Pork, Beef, and Lamb / Vegetables, Tofu and Eggs Recipes to Contemplate / Desserts / Stocks, Oils, Spices, and Sauces. The Sushi section is really about preparation of fish, how to eat sushi and a treatise on nori. In the carbohydrate division, Morimoto features everything from the lowly pork gyoza to sushi rice risotto and Teapot Soup with Matsutake Mushrooms. Treasures inside his seafood section include Lobster Masala with Lemon Cream, Morimoto Bouillabaisse, Rock Shrimp Tempura, Grilled Scallop-Stuffed Sweet Onion, Snapper Chips and Oyster Foie Gras. Throughout the book, the chef puts in his comments here and there on certain recipes. For the oyster recipe he recommends "cuts of foie gras on top of butter Kunamoto oysters, which are small." Carnivorous delights are also to be had. A terrifically named Angry Chicken (with a yogurt marinade of garam masala, coriander, cardamom and hot sauce), Grilled Pork Chops with Tonkotsu Broth, the slow-braised pork belly treat of Pork Kakuni (served on top of scallop congee and noted as a "healthy dish" by the chef as most of the fat is gone by the time the pork is cooked), and the meat-and-potatoes Hayashi Stew made with ketchup! Moving onto greens, there's a crispy Asparagus Salad, Daikon Fettucine (going along with Morimoto's self-proclaimed fondness for "visual puns," ribbons of the white radish are "posed as pasta"), a tofu steak and Curried Mushroom Salad. It's at this point in the book that Morimoto delves into some special stuff: Recipes to Contemplate. The chef tells me he wanted to include some complicated things – "you can not get blowfish very easily" – saying that he wanted to have Japanese ingredients that were rarities in the regular kitchen. These ingredients would be atypical, that's for sure: Blowfish Skin Caprese, Baby White Shrimp and Sea Urchin, Caviar Tempura, Chocolate-Coated Sweetfish Liver and the impossible-sounding Squid Strawberry Ice Candy, which he created during an Iron Chef episode. What he's doing here is, by his own admission, a bit of showboating. He says he created these Recipes to Contemplate to ask: "Am I great?" Well, if you take a gander, it is a resounding YES! Rounding out this comprehensive book of Morimoto cooking style are the desserts – Red Miso Souffle, Tofu Cheesecake and Yuzu Ice Cream, just to name a few. This cookbook isn't just about making recipes, there's history, philosophy and life lessons all rolled into a deliciously-packaged book.